The commercial media does tend to play it safe and concentrate on music by star artists. That's one reason why so many talented emerging performers don't stand a ghost of a chance of wide mainstream popularity. But there are some of those music superstars who, realizing their position and ability to reach audiences and get past the commercial media gate-keepers, have been serving as advocates for eclectic styles or artists, whose music would otherwise be relegated to the obscure wilderness of something called "public radio." Paul Simon, David Byrne and especially Peter Gabriel have all taken up the cause of world music styles and artists. Gabriel has perhaps gone the farthest, starting a foundation, a concert series and a long-running record label dedicated to introducing distinctive artists from all over the world. He has employed his share of world music artists on his own albums, also has used his auspices to bring together performers of different cultures and styles in eclectic combinations. In the early 1990s, Gabriel started holding what he called "recording weeks" during the summer at his studios in England, setting up several recording areas, and what he calls a "24 hour cafe," for people to mingle, collaborate, and then go into the various rooms, and even outdoors spaces set up for recording. A lot of music was taped in these free-wheeling sessions, but not a lot of it was released. 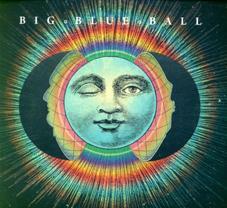 Now, more than 17 years after the first such "recording week" at Realworld Studios, an album has emerged called Big Blue Ball. After these wide-ranging sessions, with so much recorded, the tapes were apparently not well-organized, so there was a general procrastination to sort all the material out. But Gabriel and his collaborator Kurt Wallinger of the bands World Party and the Waterboys, finally got around to making an album out of some of the music laid down in the summers of 1991, 1992 and 1995. There were apparently a lot of fragments that were mixed, and a few overdubs were added as late as last year, but Big Blue Ball is finally out, and the result is both wildly eclectic but surprisingly organic and coherent. There are musicians from various parts of Africa including Madagascar, the Middle East, Eastern Europe, Japan, Ireland, the USA and UK, in styles that mix, for example, African grooves with flamenco, electronic with blues and Gospel, and so on. There is a lot of variety with no single musician heard on all the tracks. But it comes together well, for an interesting, engaging, and surprisingly danceable record. Among the notable guest artists are Papa Wemba from Congo, Marta Sebestyen from Hungary, plus Vernon Reid from the band Living Colour, The Holmes Brothers blues band, Sinead O'Connor, and of course, Gabriel and Wallinger. Big Blue Ball, is the newly released CD that resulted from three so-called "recording weeks," big cross-cultural gatherings and musical parties convened by Peter Gabriel at his Real World studios in the early to mid 1990s. The CD no doubt was the result of a lot of distilling and editing. And there were some overdubs that were recently added. In addition to Gabriel and Kurt Wallinger who put together the events, the third credited producer was Stephen Hague, and the mix engineer was Tchad Blake, who contributed a lot. It all comes together remarkably well, given very different stylistic and cultural ingredients that were added into the auditory stew. It's not only fascinating, but a CD for the most part, is full of great, danceable rhythmic grooves. Sonically, the recording gets a full grade "A" from me. The mix of different sonic elements is very well handled, and there are some creative but tasteful studio effects. Perhaps most notable in these days of hyper-compressed CDs is the good dynamic range -- the music actually moves between loud and soft. It's a welcome reminder of what the humble CD is capable of. Once again, Peter Gabriel is putting himself on the line for a cross-cultural world music project. It may have taken as much as 17 years to come to fruition as a CD, but now that it's out, Big Blue Ball is a worthy CD that should appeal to both world music fans and to fans of Gabriel himself.